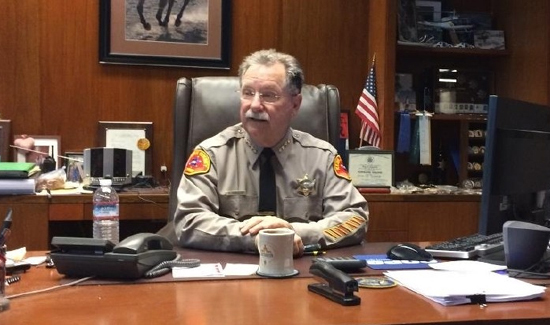 Sheriff Donny Youngblood (above) is furious over a report from Immigration and Customs Enforcement that lists Kern County as the third-worst in the nation for not honoring so-called “detainers” of inmates. That report shows Kern declined those detainers 65 times during one week in February. Youngblood says his department doesn’t do any detainers at all, and that they cooperate with ICE in other ways. “That we, Kern County, was the third-highest behind Los Angeles and New York for not honoring detainers — how in the world could that possibly be true?” Youngblood said on Thursday. The sheriff said he called local ICE agents his department works with, and reports they apologized, but he didn’t get an adequate answer about the data in the report. Youngblood says detainers are a request by ICE to hold an inmate for 48 hours after their release from jail. The sheriff says a court in Oregon had ruled the detainers violate the Fourth Amendment. The sheriff says after that came down, he then allowed ICE to have agents in Kern County jails and access to their data base. The ICE agents can see who’s in jail, and when they’ll be released, and decide if they want to pick up a person who may need to be deported. Youngblood says the Kern jails respond to “requests for notification” from ICE. And that having their agents in the local jails has been going smoothly. By late Thursday, an ICE spokesman sent Eyewitness News a statement. “The jurisdictions reflected in ICE’s Declined Detainer Outcome Report (DDOR) are jurisdictions that have — in the past — publically expressed unwillingness to fully comply with ICE’s detainer requests or have not provided ICE with sufficient time to allow for the safe transfer of a detainee,” the emailed statment reads. But, Youngblood had said the ICE agents get the information about when an inmate will be released, and the agents can be there to take custody at that time. However, an ICE spokesman also told Eyewitness News that “detainers” may still be filed. And, if someone is picked up, it may be discovered then that a detainer had been issued for that individual at some time. The ICE statement said they want cooperation from local law enforcement to help ensure the safety of the public. “Should a jurisdiction make a posture change with regard to their policies involving detainers that is captured as a matter of public record and that ICE can point to, ICE will revise the report accordingly,” the state added. Youngblood says the numbers in the report don’t make sense. He’s also upset that the Fox News Network ran the story without checking into the numbers. Youngblood says he wants answers, and he’s sent a text to the head of ICE. “This thing has to be resolved, you can’t go around putting out fake information, information that’s not true,” he said. The sheriff disputes his office declined the detainers 65 times in one week, and also noted the department had responded to 25 “requests for notification” during the entire month of February. He thinks the terminolgy doesn’t match, and the numbers in the ICE report are way off.